The Federal Trade Commission reports that over 400,000 Americans fall victim to identity theft every year as a direct result of stolen mail. And that is just 4% of the 10 million victims of Identity theft annually. 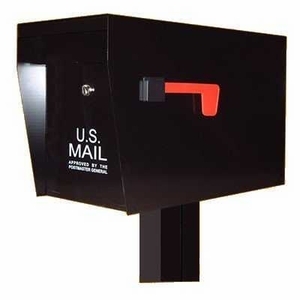 Here is a Great selection of Aluminum & Steel Locking Mailboxes in a variety of styles, sizes & colors. Click here for a pop up comparison table of some of our locking mailboxes. All our Locking Mailboxes are approved by the US Postal Service. Some mailboxes ship via Freight Truck or UPS Oversize. 10 Styles, with a Large capacity locking mailbox approved for curbside use by the US Postmaster General. 5 Styles of Locking Mailboxes with Rust Free Aluminum construction, approved for curbside use by the US Postmaster General.